Labour MP David Lammy wants an apology from everyone who voted for Brexit. He’s collecting names. He’s going to be busy, what with there being 17.4million of us who voted Leave to process. 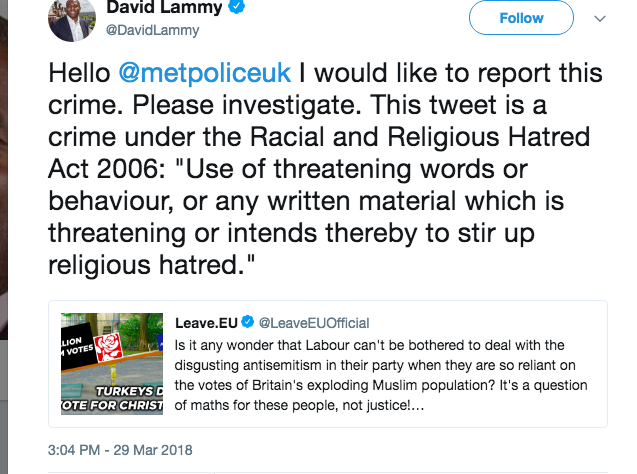 But Twitter, where Lammy made his reasoned request, can handle some of the admin. And he can ask fellow Labour MP Naz Shah to help. She’s also outraged by a nasty tweet from a Brexit-supporting group. Like Lammy and Jeremy Corbyn, Shah is highly sensitive to racism following a cathartic “journey”. The adult woman voted into the Commons by the good people of Bradford West discovered that advocating for the mass deportation of Jews to the American mid-West was a bit, you know, akin to Nazi and Stalinist methods for dealing with the ‘Jewish problem’. She apologised and is now on the side of the knowing. 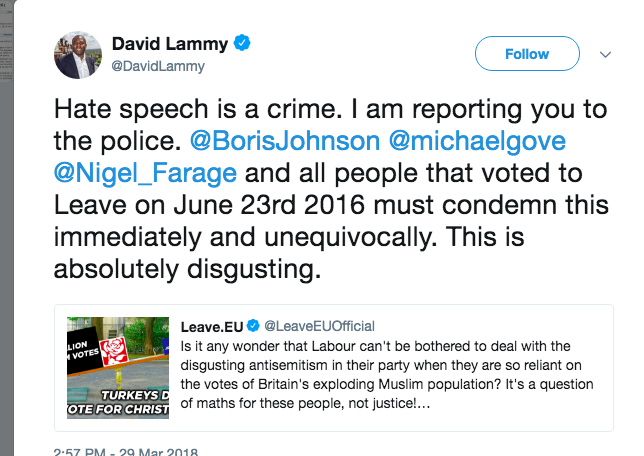 The trigger for Lammy and Shah’s ire was this tweet from the account @leave.eu. Is it any wonder that Labour can’t be bothered to deal with the disgusting antisemitism in their party when they are so reliant on the votes of Britain’s exploding Muslim population? It’s a question of maths for these people, not justice! To blame Muslims for creating Labour’s cesspit of anti-Semitism is wholly wrong. To pick the word “exploding” to describe Muslim families is pathetic, nasty, divisive and anti-human. To claim all Muslims vote as a block demeans their autonomy. The tweet stinks. Although that’s not to say Labour with its commitment to identity politics doesn’t use craven means to shore up its vote. Perhaps the party believes taking on any anti-Semitic Muslims not worth the effort if it affects the polls? Perhaps Labour is not all that in to individuality, equality and free will. Perhaps Labour doesn’t trust voters, preferring to package us into boxes according to our race, religion, age and gender, before proposing policies that appease each ‘community’ by pandering to what they perceive our prejudices to be? April 29 2016: Mr Livingstone was suspended for a year in April 2016 over his claim that Adolf Hitler had supported Zionism in the 1930s. So much for the politics. Lammy’s upset by the tweet. And he wants you – all 17.4m of you deplorables who voted Brexit – to apologise for one bellend’s sad message. He has not called for every Labour Party member and voter to apologise for anti-Semitism in the ranks. But surely that will come. Hate speech is a crime. I am reporting you to the police. @BorisJohnson @michaelgove @Nigel_Farage and all people that voted to Leave on June 23rd 2016 must condemn this immediately and unequivocally. This is absolutely disgusting. All 17.4 million of you “must” condemn this tweet now. Or..? Be arrested? Be named and shamed? Be forever branded a racist? Be disgusting? PS: The problem is, if course, that Lammy has nailed it. He’s correctly reasoned that Brexit only won because the 17.4 million of us who usually vote for the BNP would not be denied. 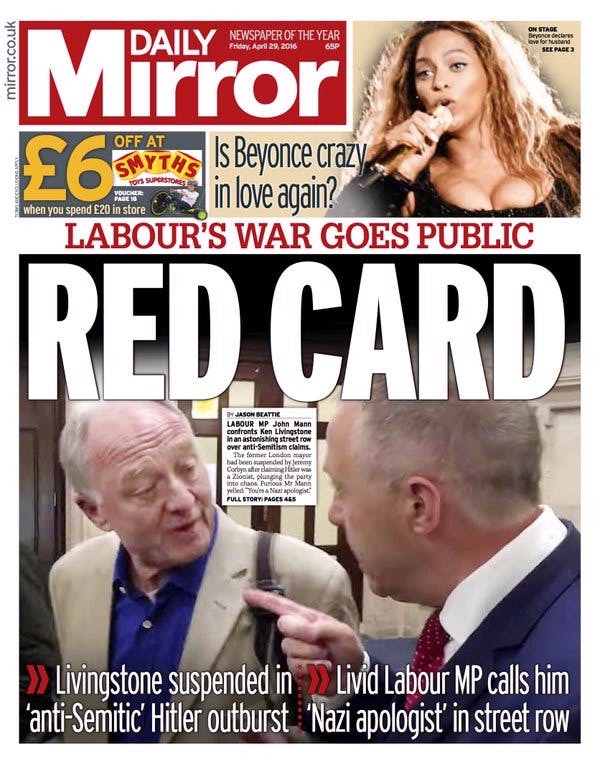 Of course, had we known how racist Labour was*, we’d most likely have gone with them. But their official position was unclear during the EU Referendum vote, as nuanced and slippery as their leader, so Brexit was the chance for every racist – all 17.4 million us – to win the day. Finally. * Labour’s gonna walk the next election if it keeps the anti-Semitism thriving. The BNP never stood enough candidates to make us believe bigots could form a Government. But with Labour’s anti-Semitism being well advertised, it’s all vote now and vote often. First they came for the EU… Raus!